Unlike a herpetologist, who studies amphibians and reptiles, an ophiologist is a person who specializes in the study of snakes. Reptiles are generally covered with bony plates or scales, which is one of their identifying characteristics. Snakes’ bodies are covered with small plates called scales or scutes. Have you ever looked closely at the scales of a snake? The scales on the back of a garter snake have ridges in the middle. They are called “keeled” scales. Snakes with keeled scales usually have a dull appearance overall. Other snakes have smooth scales without the keels. Snakes with smooth scales have a brighter, shiny appearance. Herpetologists (scientists who study reptiles) use the position of the different types of scales as one way to identify snakes. Snakes have a special transparent scale over their eyes called a brille. It takes the place of an eyelid. Because of the brille, snakes can not close their eyes. 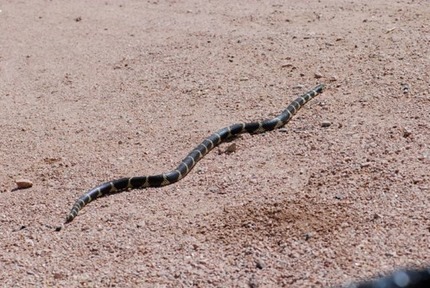 As a snake grows, it periodically sheds its outer skin. When the snake is about to shed, its brille becomes cloudy.